Until 2001, as farmers in the Klamath Basin, we had no clue about any 'science' we were supposed to have to justify our existence on the land and our right to use water we store in the Klamath Project. I remember standing among a few hundred farmers and ranchers when they drove more than 300 tractors to the Klamath Falls U S Bureau of Reclamation (BOR), because they were the ones who would turn off the headgates that stopped our irrigation water. 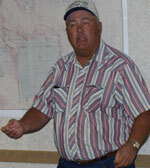 And I remember the first speech I'd ever heard about Klamath Basin science, delivered by John Crawford, Tulelake farmer. He knew all about science, because he is one of those unsung heroes who had been going to water meetings for years, defending our right to irrigate our fields. Many in the crowd were basin settlers who had helped reroute the lake decades ago, building ditches and storing the water to irrigate. They paid for the Klamath Project. They built our community from nothing but a drained lake bed, built our roads, schools, churches, and our homes. They have water rights deeded from a United States President. What I remember of John Crawford's speech was utter wisdom and hope. After that our water was shut off because the government agencies and environmental groups have something called an Endangered Species Act. Despite the fact that they did not know how many 'endangered' sucker fish there were, are, or how many they want, they are 'endangered'. The lake was flooding over the top in 2001, yet they said it was a drought. A 'biological opinion' (BO) said that the lake had to be artificially elevated for the suckers; higher than was possible before the Klamath Project was built. According to John at the tractor rally, in 1992 we had a horrible drought, yet there was no fish kill. No suckers died. In 1996 we had record high lake levels and there was a fish kill. So then we all knew that when that news got out and everybody learned that the suckers don't need that much water, they would let us water our crops and tend our fields. John believed that and so did we, since we thought they wanted what was best for these fish no matter what happened to us. And we were learning at that time that, regardless of the forthcoming bankruptcies, suicides, divorces, depression, hundreds of dry domestic wells, auctions, illnesses, decimated businesses, refuges, and economy, our own government did not care what happened to us. There was a Congressional Hearing in Klamath Falls in 2001 after the water shut-off. The common voice of the people was, we want peer-reviewed science, not just that of tribal biologists who were hired to shut down our basin's agriculture. We want to be at the table. We want a voice. We want equal rights with the sucker fish. We want to share the water and not have it all taken from us. We have water rights. The sucker fish do not need all of our stored water. Remember, in 1992 the suckers did fine. They did not listen. Our spirits withered along with our crops. 5 months ago an Oregon State University professor, Dr Ken Rykbost, reviewed the Hardy Reports, and detailed how the threatened coho BO's for the Klamath River were flawed. The Department of Justice, along with the Department of the Interior and Bureau of Indian Affairs, hired Dr. Hardy to witness against the farmers in water adjudication. There was no outside peer review. Our irrigators were not allowed at the table or even in the room. Data was from a 30%-above-average-precipitation time frame. The operations plan derived from Hardy's reports demanded more water from the irrigators than the Klamath Basin can produce in most years. A model was taken from the only years that stream flow records are unavailable in the watershed. A community and ecosystem that produces 3.4% of a watershed were being destroyed by being responsible for 100% of a watershed's perceived problems. The river flow requirements were based on the highest water years in history. I was in Yreka and heard the outcry from the tribal biologists and environmental groups. They did not like what Rykbost had to say. They said it was not peer-reviewed so it should not be heard. Yet the Hardy science was not peer-reviewed and it was false science. And he was hired to prove an agenda that would be detrimental to the Klamath Project. In 2001, Gail Norton, Secretary of the Interior, summoned the National Academy of Science (NAS) to peer review the science being used to dewater the Klamath Basin. We were happy. The Tribes applauded the decision. Justice and truth at last! The NAS draft report said that lake levels and river flow management was not based on science. That scheme would not benefit the fish. The environmentalists and tribes did not like that answer, so we were forced to live by the old BO until the final report came out. At last, the long-awaited NAS final report was divulged last fall. And last week there was a science convention in Klamath Falls, Oregon. Over 150 scientists came from all over the United States, along with many government agency bureaucrats. 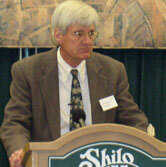 At this convention, Dr. William Lewis Jr., University of Colorado, explained the NAS conclusion on suckers. He is on this most prestigious science team in America. So for a time, if only for 4 days, I felt the same hope as when John Crawford delivered his sucker speech. First Lewis complimented Dan Keppen, Executive Director of Klamath Water Users Association, for advocating water use with out being destructive. "That's the kind of interaction we always need, as well as working with the agencies in the Klamath Basin." Lewis explained that the suckers were listed since 1988 because of over harvest. They stopped fishing in '87 but they did not recover. The lake has gone from 3' range under natural conditions to experiencing 6' deep in current dry years. He said that the committee looked extensively at water levels, and they find 'no hint of a relationship' between lake levels and fish survival. He also said that there was no relationship between lower water levels and extreme ph levels. The lake is 140 square miles...that (the ph) is not feasible to change. And "the committee cannot support the idea that water levels effect algae growth. It can not be achieved by lake levels. 92 was the lowest water year, and they expected it to be the least favorable for fish. The lowest water year produced the same amount of larvae as other years." Lewis said that Clear Lake, a reservoir created to store and evaporate basin water, does not have the habitat that scientists are trying to create in the Upper Basin for suckers, yet Clear Lake has stable populations of healthy suckers. There are 17,000 acres of restoration already. He cautioned how much faith we should put into wetlands regarding the suppression of algae. And he said that we should not count on retiring agricultural land land for saving suckers. Also, the committee found that Klamath Project irrigation practices did not kill some chinook salmon 200 miles downstream in 2002. Project irrigators use 3.4 percent of the water that reaches the mouth of the Klamath River. Jacob Kann, ecologist and scientist for Klamath Basin Rangeland Trust (KBRT), believed that timing and flows are related to the ph levels. Lewis responded that the water is always ph loaded, "the increase doesn't matter if it's always been saturated." Kann insisted that we need lake level/river flow management. Tribal biologist Larry Dunsmuir felt like lake level management was necessary for emergent vegetation, and Lewis responded that Clear Lake has no emergent vegetation yet production of larvae is not shut off in Clear Lake. Wow. There it was. Four days of listening to 150 scientists say that peer review is mandatory. They said there is not enough data to even make a restoration plan yet. . Reducing ag lands will not help fish. Wetlands may not help fish or water quality. Unnaturally elevated lake levels and river flows will not help fish. Hoorey! That is what John Crawford told us in 2001, but he was 'just a farmer.' Nobody listened. Now they will! This is an above average water year, and we are told by the Bureau of Reclamation that we must forgo 75,000 acre feet of our irrigation water because of the flawed Hardy-based BO. It is a mandatory 'water bank'. Even if we pump our aquifer and let land lie fallow, if the lake level drops below a certain inch, they may shut down the Klamath Project. Klamath Tribes want 690,000 acres of the Winema/Fremont National Forest returned to them again . "It’s not a land for water swap that’s being suggested. The Interior Department and the State of Oregon have said that land return is unlikely in the absence of a water settlement. And the Tribes have said that a water settlement is unlikely in the absence of the land return." Bud Ullman, attorney for the Klamath Tribes. The Tribes are claiming more water than exists in the Klamath Basin. Their charts show pictures of the coastal fish kill and they blame us farmers. They want more land taken out of agriculture. They have filed against us in a lawsuit which blames us for the Trinity river fish dying. KBRT (Rangeland Trust) is paid by the government to pay people to not irrigate. This year they hope to get paid to not irrigate 20-30,000 acres of pasture, decreasing cattle herds by 70%. As quoted from the Cattlemen's letter, "The executive Committee of the Klamath County Cattlemen’s Association is opposed to the deliberate actions of the KBRT that threaten to dissolve our industry. The cattle industry in Klamath County is a 50 million dollar per year industry. The undesirable consequences of this direction include a loss of irrigation efficiency and a loss of food and habitat for regional and migrating waterfowl. An additional consequence is a drastic reduction in late season water release from flood-irrigated pasture." The US Geological Survey (USGS) report regarding the Rangeland Trust science clearly states that their science (Jake Kann and Rangeland Trust owner Jim Root's daughter being the scientists) was flawed. They are saving less than half of the water that they have been paid for. Their "limited data" should be nothing more than a basis for a "hypothesis" According to Jim Root in our Herald and News, he disagrees with the approach recommended in the USGS report of waiting five to ten years of forbearance and restoration while baseline data is collected; "We disagree with that approach. It may be accurate from a scientific point of view, but from a practical or political point of view, we feel like we need to be doing actual work during that five to ten year period." Despite the USGS recommendations, the USBOR is negotiating with KBRT again this year. Environmental groups keep us in constant lawsuits, the US Government is legally battling us to keep from compensating us for taking our stored irrigation water in 2001. The US government has not studied delisting the sucker fish. So, John Crawford, the NAS report said that you were right. We have shouted it from the rooftops. But, science didn't matter, did it? The word 'agenda' turned out to be bigger than 'science'. So, NOW WHAT? And if we are not given certainty of water deliveries to our crops while the agencies make unreasonable demands of the irrigator's stored water as they look for 'solutions', the verdict is death to our agricultural community.